I would be interested in your opinion of this mark on a plate. I can find no information in the books that I have. The plate has a grey tint to it, which I believe indicates Chinese origin. The other side has a hunting scene on it. One of "Eight Buddhist Emblems"
The mark is a "conch shell". 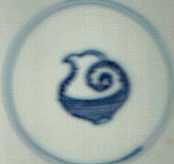 The shell is one of the Eight Emblems of Buddhism and occurs on Chinese porcelain as base marks and within the decoration. It is ultimately of Indian origin. These marks came into use during the later part of the so called "Transitional" period, i. e. after that the northern China had been conquered by the Manchus, but before and for a few decades after, that the southern part of China had become under Manchu - Qing dynasty - rule. which is considered to have happened around 1683, and for a few more decades. During the Kangxi period (1662-1722) these marks came to be quite common since the support for the new ruling dynasty was not that firm and loyalty to the former Ming dynasty still existed. Because of this a lot of improvised symbols was used insted of the dynastic reign marks. Whether your mark is actually from the Kangxi period or not is not really possibly to tell from only this small picture, but, maybe. Please see my large section on MARKS for more information.